In the beginning, there was darkness. And in the darkness was the Mana, and in the Mana, The Visions. 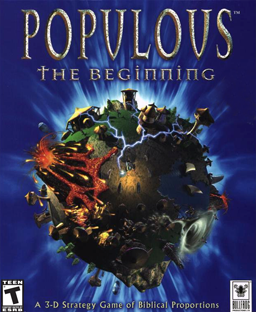 Populous The Beginning is a God/RTS game that puts you in command of a Shaman who can cast devastating spells to turn the battle field to her favor. However she is not the only one who has the Ability. There are three other tribes with similar "Shamans" so the only thing you can rely on is your quick wits and Strategic mind. Your followers will help you in the battle to help you become the new God of the Solar System. The campaign has about 22 levels in it. 22 levels of fun, action and major army's killing the heck out of each other! you will only be disappointed when you reach the end. One thing is that this isn't in stores anymore so there's no way of playing it now unless you buy it on Ebay or somthing. System Requirements: Pentium 133 MHz, 16 MB RAM, Windows 95, DirectX, CD-ROM drive, and 100 MB hard drive space. Due to the official services going offline 13+ years ago try www.popre.net for an active community. PopRe Site to download the game, its expansions, forums, to play online, and much more! All campaigns also free to DL here Pop Campaigns. Awesome Game & Mods. I´m Just Testing all Mod´s! Really someone has to mod this game. I have just red a Wikipedia page about this game which is very unfavourable for this release, but this game is awesome! Same like Homeworld 2 someone should remaster it. I like these messy battles and economics where only wood piles are important. We offer a wide variaty of maps, modifications, singleplayer campaigns and a multiplayer matchmaker to play online! we need a propa modden day revamp off this. i love this game, it was always fun to mess around and deform the landscape, one thing i always wanted tho was a way to play the other colours/tribes.